Using our specialized WordPress theme you can create a beautiful website for any sport club. You can create a website for one club or more sports clubs. Using ready to use elements you can present all information anywhere you like. You can add basic information about your club, past and history, news and information about upcoming events. Show players and trainers. Display upcoming matches and match history. Each player can have it’s dedicated page with biography and video or photo gallery. You can easily create statistics as number of goals or assists. You can also create an event page with a countdown counter to the next match. You can also show interesting stats about numbers of goals and assists. Do you need a new staff member? You can use Job Offer element for this purpose. Every good sport club website needs a blog. Your fans will love reading news from you. There are so many topics you can write about. Get more fans or new players using your website and internet presence. You don’t need to be a programmer or web designer to make it. Display latest and upcoming matches on any page. You can categorize matches into categories. Show all matches on one page or display one category only. You can also display upcoming matches only, all matches or recent matches. Each match can have Match name, Teams names, Date and time of the match, Final score, Description or link to blog post. All Matches Table element can be added to any page using drag & drop Page Builder. You can show all matches in your league. Advanced settings allow you to display nicely styled Title and Description. 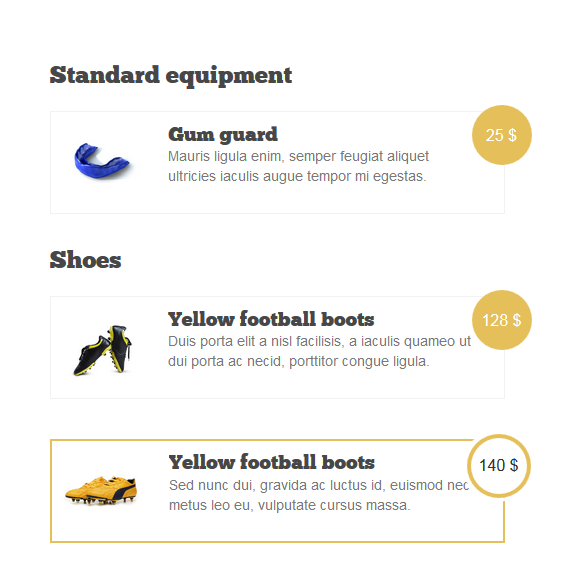 You can display this element full width or inside columns. You can control about everything. You can also add your matches as a separate tables. It’s up to you how many of them you’d like to show on one page and where you’d like to show them. There’s no limit on how many matches you can add using Matches element or how many matches to show on your website. You can also colorize them for easier orientation. You can combine them with other available elements to create interesting content. For example, you can use columns, add photo gallery, text, list blog posts from given category or embed promo video. All colors in this theme can be configured directly in the admin panel. You can set them up to match your club colors. If you’d like to have a website for more sport clubs or the whole league, you can differentiate individual clubs using colors. That will simplify navigation and orientation on your website. Everything using handy color pickers, for example color of Matches table can be configured in the Advanced settings right inside Page Builder. Help your club going by selling presents & gifts with your logo, t-shirts or sport goods. Products element will help you present what you offer. You’ll create a professional looking presentation extremely easily. Product item can be added very quickly, you don’t need to configure whole e-commerce solution. Customer can make an order using the contact form that will be sent to your email. You can show products almost anywhere on your website. 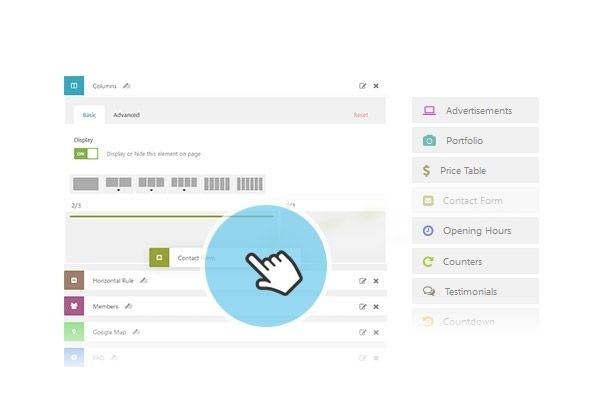 You can create different product categories and show them on separate subpages. You can also combine Products element with other elements, embed video, links to social networks or show information that you’ll be selling your products during your next match. Fans love your players. Players are the reason they watch your matches. They want to know everything about them. SportClub WordPress theme helps you establish relationships with your fans. You can show the whole team on one page or create subpage for each specific team member, trainer or manager. What information can you add using Members element? You can also create categories to group team members into logical groups. Element can be almost anywhere on your website. Everything can be configured based on content that you have. You can show and hide sidebar with widgets, display in columns together with some other element. You can also show it as a full width. It’s possible to show your members as grid or one line. Photo size can be also selected in the admin panel. You can also turn on carousel and auto-play to get an interesting effect. Everything in few clicks in the Page Builder. Advanced settings will help you create remarkably interesting sections with parallax effect. Each Sport club has partners and sponsors that support it. You need to show them on your website that’s why we’ve made Partners Element that will help you with that. You can administer your Partners from one place and then add them anywhere on your website. You don’t need to know programming or webdesign to add new partner’s logo. What information can you add using Partners element? Do you have different partners or sponsors for different events? You can easily categorize your partners and show only selected ones on given subpages. Standard Elements are available all the time. You can purchase Single theme or Membership. These universal features are very useful for personal and company websites. I would to buy sportclub theme, but I think this theme is only for rugby club? Can I add table from soccer league? Are there .psd where I can change person from photo – for example other football player? Like the theme..but are there any video tutorials in how to build it up. We made our first page watching videos in you tube…do you have videos we can follow to build our site? So, Everything I need is the psd package for 10$ and the single theme for 55$? Where do I have to chose the language? Is it possible to install “Widgets”? All the results, members, etc. are on http://www.fupa.net and they deliver the right code for embedding. Thank you for your message. You can install 3rd party plugin that offers new widgets. No problem with that. If the plugin is written correctly it’ll work with our WordPress themes. Can this theme support more than one sport at a time? ie. a rec league running a dozen different sports. If so, how would it organize the information for each sport? Very poor support!! Don’t buy anything from AIT Themes. Support is very, very bad. Respond times of 1 day are more like 2 months. I bought the driving-shool theme 2 months ago, posted several support requests with no response at all. update 2016 : Again, very disappointing service. Latest theme update was promised on 20.1.2016 and it is still not available on 28.1.2016. Completely unreliable company, late responses, bad management of expectations, poor service. Please accept our apology for the trouble you had to experience with mentioned “theme issue solving”. The problems concerned in misguiding you, i have confused themes. The information you have got was regarding SOLITUDO theme (you can check this in the changelog file mentioned theme). Your time is important and we realize you expected our designer to fix the problem without delay. New release with fixed problem will be released in the shortest possible time due to fact that we have set up it the highest priority (we expect it could be solved tomorrow). Anyhow, i will confirm it directly on your email. Again, we are sorry for what happened. Does your theme sportclub support RTL? we are sorry, we do not have an experience with it, theme doesn’t support RTL design. Is it possible that members from our club can register and manage their own profile and or team? We have a club with over 300 members and don’t want to manage that all by myself. thanks fro asking. We are sorry, theme doesn’t have such a functionality. I am looking to use the Sportclub theme for a soccer website. The scoring (match manager) system, can that be adapted to show soccer scores? Do you have a shopping cart feature so we can sell league merchandise? I’ve a question about this theme : Is it compatible with Buddy Press ? I’m sorry. None of our themes are compatible with this plugin. Did anyone of your them are compatible with a forum plugin, like BBpress, CM Answers, WP Symposium or anyone else? thanks for coming back on this. As we are not performing the testing of a 3rd party plugins, i am not able to ensure you about the compatibility. Anyhow, further CSS custom code might be needed to implement in order to get nicely styled website. Hi, I purchases SportsClub a year or so ago and my site http://www.crestwoodfootball.com/ has recently been messed with. Do I need to repurchase this theme to fix? thanks for contacting us back. It’s highly possible that the problem has raised due to not updated theme. Please check your theme version – the current supported version is v1.80. Hereunder i provide you a list of some latest updates we have released recently. I would like to inform you that keeping your website up-to-date is the best prevention how to avoid any inconveniences in the future (FYI: WordPress CMS release new updates on regular basis, plugins by a 3rd party as well, therefore we must perform new updates accordingly…) Thanks for understanding. I search for a theme. I’m from Germany. i hope you can understand me. – Music Band Profile pages. – Event Guide for Event of Band, Festivals with Tickets buy on it, Event Flyer – Event Date – Infos – many more. Please info. What can i do as “BASE Theme” can i buy a Plugins for one Theme? Theme is compatible with WooCommerce plugin for on-line sell (manageable by admin only). thanks for asking. Yes, theme use WYSIWYG editor in the each custom post type that come pre-made with the theme.